The gold / champagne colored iPhone 5S has been getting a lot of attention from the rumor mill, but there might be a fourth color option on the way. 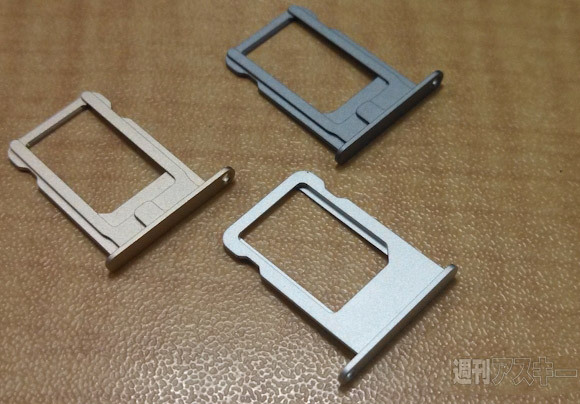 A grey SIM card tray popped up in a repair shop in Japan and it looks just like the leaked iPhone 5S trays. The image above compares it to the gold iPhone 5S nanoSIM tray and the white iPhone 5 tray. The gray SIM tray is too dark for the white iPhone and too light for the black iPhone. It's possible that Apple will tweak one of the two standard flavors of its next iPhone but it's also possible that the company is trying out a fourth color. Even if Apple is indeed testing a fourth color, there's no guarantee we'll see them all at the iPhone unveiling (which is allegedly scheduled for September 10). Companies usually try different prototypes before settling on a final design. New colors could be for IPhone 5c, IPhone 5s might follow the same tradition with Black & White colors..